US football coaches and players across the country entered the political arena over the weekend by taking a stand against President Donald Trump. The president provoked outrage in the National Football League (NFL) after he suggested players who failed to stand during the US anthem should be sacked. Several football teams were seen linking arms or opted to remain in the locker room as the anthem played. Others knelt in protest against racial injustice and police brutality. But what do the various forms of protest mean? Why were some players kneeling? Former San Francisco 49ers quarterback Colin Kaepernick started the protest when he sat down as the Star-Spangled Banner played during a pre-season game in 2016. He explained his gesture, which later became taking a knee, was meant to highlight racial injustice and police brutality against African Americans. Some commentators suggest Mr Kaepernick, who remains unsigned this season, was blacklisted from the sport for his demonstrations. Angered by Mr Trump's comments over the weekend, dozens of players followed Mr Kaepernick's example. 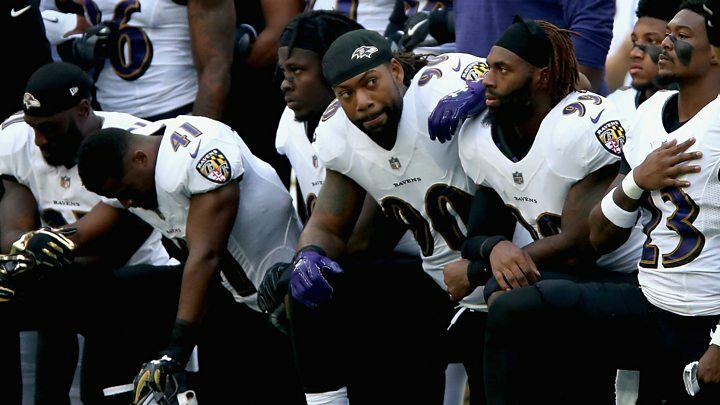 Nearly two dozen members of the Jacksonville Jaguars and Baltimore Ravens took a knee on Sunday at a game in London while nearly all of the Oakland Raiders were seen kneeling or sitting at a game against the Washington Redskins. Miami Dolphin players on Sunday wore shirts emblazoned with the phrase: "#ImWithKap" during pre-game warm-ups. Dolphin Julius Thomas, who previously stood during the anthem, said he wanted to send a message that he did not condone what he sees as Mr Trump's intimidation tactics. "I'm not OK with somebody trying to prevent someone from standing up for what they think is important," he said. Why were coaches and players locking arms? Several players and coaches suggested they locked arms to show team unity in the wake of Mr Trump's comments. Philadelphia Eagles player Malcolm Jenkins urged fans in a tweet before the game to join the team in locking arms to show unity. In a rare appearance on field, Jaguars owner Shahid Khan was seen entwined with his team's players while Ravens Coach John Harbaugh was also spotted linking arms with players. Mr Khan, a Pakistani-American and Republican who has contributed to Mr Trump's inauguration, said in a statement he stood with the players to express his support for them "following the divisive and contentions remarks made by President Trump, and was honoured to be arm in arm with them". He added that "we can and should be united in the effort to become better as people and a nation". Why did some teams remain in their locker rooms? 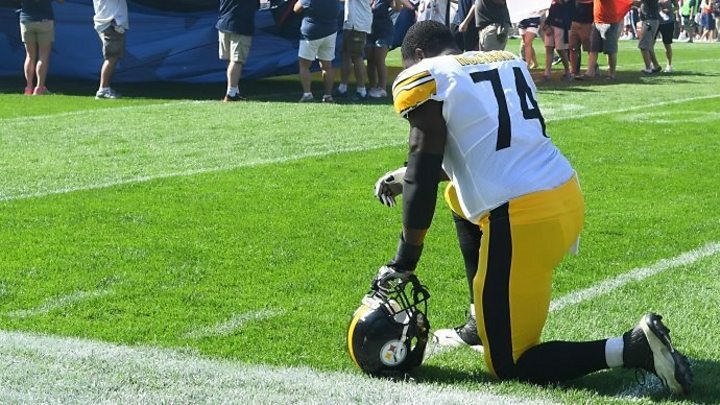 The Pittsburgh Steelers were nowhere to be seen as the anthem began to play at Soldier Field before their game against the Chicago Bears. Some suggested it was an attempt to avoid the political row altogether, but Pittsburgh quarterback Ben Roethlisberger explained to ESPN that his team decided to stay in the locker room during the anthem as a symbol of solidarity. "By no means, by no way shape or form, was there any disrespect intended towards our troops and those who serve this country," he told ESPN, adding the team has "the utmost respect for them". "We decided we were going to talk about what we were going to do because we knew some guys wanted to take a knee, guys wanted to stand. We said whatever we do, we need to make sure we are unified as one group because that is what we are about and that is what it should be about," he added. "Staying together as one unit, one group, one brotherhood, things like that." Seattle Seahawks and Tennessee Titans players also opted to remain inside before their games and released similar statements. "We will not stand for the injustice that has plagued people of color in this country," the Seahawks said in a statement.